January 24 is National Peanut Butter Day. Peanut butter is a classic American food, so why don't you celebrate this day? Many manufacturers tried to use peanuts for different production. Canadian Marcellus Edson made cooled product of peanuts and sugar, that had a consistency like that of butter, lard or ointment. John Kellog used boiled peanuts for his own peanut butter and George Bayle tended to making peanut butter with roasted peanuts. Today peanut butter is a product number one in over 90% of American families. It comes in two different varieties: smooth and chunky. Women and children prefer smooth variety, and men go for the chunky one. 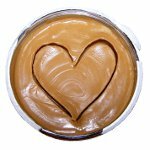 Did you know that peanut butter is cholesterol free and it's a great source of protein? In fact high protein content draws moister from your mouth, that is why peanut butter sticks to the roof of your mouth. Celebrate National Peanut Butter Day with some peanut butter spread on your toast or just with a spoonful right of the jar. And remember, that it takes 550 peanuts to make a 12-ounce jar of creamy peanut butter.